LG PJ9 Levitating Speaker set to unveil in CES 2017: Music taken to a whole new level! LG PJ9 Levitating Speaker set to unveil in CES 2017. 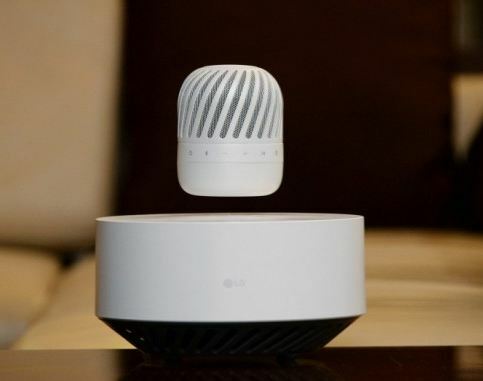 LG is all set to take music and boom!, to a whole new level, with news coming in of a Levitating speaker release, in CES 2017. The speaker isn’t just a levitating one, but, also has simplistic captivating design and an overall portable look. The floating speaker from the image is suspended in air from a base like structure (Levitating Station). The portable speaker is a wireless one which is powered by the levitating station and the speaker is able to float with the help of electromagnetism. The levitating station consist of Dual Passive radiators and a subwoofer while the portable speaker has 360 degreee omnidirectional driver. Both parts have speakers and can play sound simultaneously in synchronicity for higher intensity or individually. LG PJ9 battery can serve for up to 10 hours. The portable speaker charges wirelessly using the Levitating station. When the battery of the floating speaker goes completely low, you have to manually place the speaker close to the station for wireless charging. But, when the speaker is around the station, it descends automatically on the station and charges wirelessly by itself without any intervention. LG PJ9 floating portable speakers and Levitating Base station can be connected/paired with other bluetooth devices to work at the same time or separately.